Western Red Cedar Lumber: you asked for it, we listened, and it’s here! The Lumber Baron is now stocking a full line of Western Red Cedar Clear #2 and better, old growth, vertical grain lumber products for sale. Known for its tight grain structure, distinct aroma, resistance to decay, and beauty, our Western Red Cedar lumber is a wonderful choice for decking, siding, fencing, posts, or shingles. No need to worry about sustainability, all of our Western Red Cedar lumber is also 100% PEFC Certified. Light in weight, durable, and easy to work with, western red cedar lumber has been a popular construction material for many years. With a heartwood that ranges in color from reddish to pinkish brown, often with streaks of dark brown, Western Red Cedar (or WRC) is easily workable. It glues and stains well and is rot and insect resistant. We highly recommend you use stainless steel with Western Red Cedar as “bleeding” (black streaking) is a common occurrence when used in conjunction with iron based fasteners. Rough Cut Western Red Cedar Lumber – The Lumber Baron offers dried western red cedar lumber. Rough cut cedar lumber is available in several 1x and 2x sizes, including 4″, 6″, 8″, 10″, and 12″ widths. Western Red Cedar Lumber Beams and Timbers – For natural wood that can stand the test of time, Western Red Cedar is ideal for a trellis, pergola, and arbor projects. We regularly stock a variety of sizes, such as 4×4, 6×6, 8×8, 10×10, and 12×12. Regular stock cedar beams range from 6 to 20 feet in length, with longer lengths available upon request. Cedar Fence Palings – Cedar makes an excellent privacy fence. Creating a rustic fence that will look great for years is as easy as picking up a bundle of our high-quality cedar lumber palings. The Lumber Baron is an experienced lumber company, including milling cedar material to meet your specifications. Want to turn those beams into 3×3 or 4×10 sections? We can mill to custom sizes to give you exactly what you need. Need custom surfacing or special milling? We can do take care of that as well. At the core of our product list, The Lumber Baron’s selection of Western Red Cedar Clear #2 and better, old growth, vertical grain lumber products is extensive. 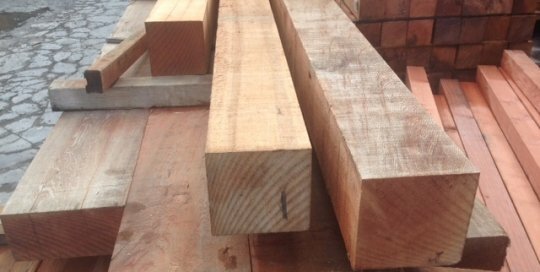 From 1×4 to 10×10 beams, we have the hard to find, quality western red cedar you are looking for. To top it off, we provide custom milling and surfacing to give you the perfect look and fit for any project you undertake. We even provide delivery to the job site, so you can rely on your lumber being available when and where you want it. Sticking to our slogan of REAL.GOOD.WOOD. The Lumber Baron offers only the finest Western Red Cedar available. 2×4, 2×6, 2×8, 2×10 and 2×12 (rough Western red Cedar lumber, both green and kiln dried) 1x4, 1x6,1x8,1x10,1x12 Surfaced available with a small lead time. Great for a rustic looking fence, our cedar fence palings are available by the bundle.